Au revoir, dear Paris. We had a wonderful time in this beautiful city, but tomorrow morning we leave for home. Sad to leave and looking forward to getting home-the best way to feel at the end of a trip. I love the beauty and history here, but I have noticed a few changes since we were here three years ago. It doesn’t seem as crowded. I had read that tourism was down, and we certainly noticed fewer people on the streets. There was a stronger police presence and increased security checks at public sites. We got used to seeing young soldiers walking around with automatic rifles. Although friendly before, staff at restaurants and shops seemed to make a stronger effort to be welcoming. I got a Parisian cold, so our last day was a bit low key. 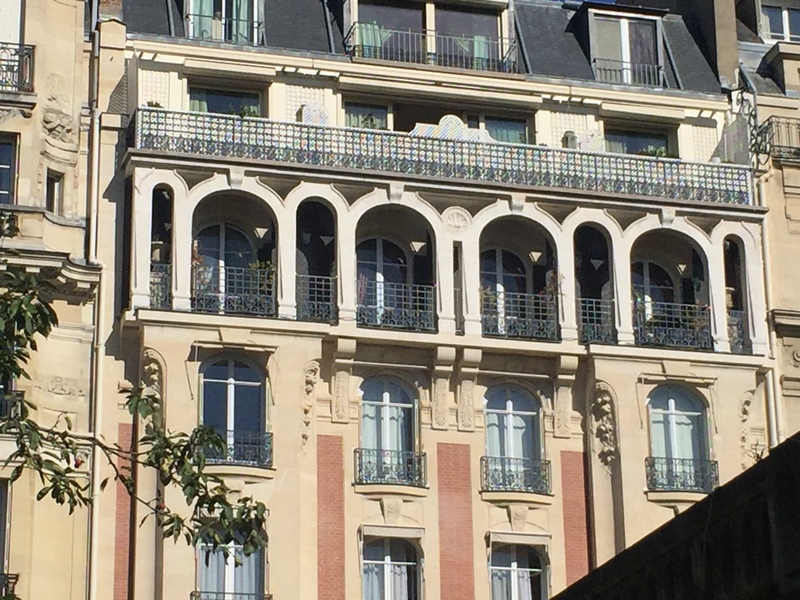 We walked around our arrondissement and enjoyed a final view of some lovely sites. 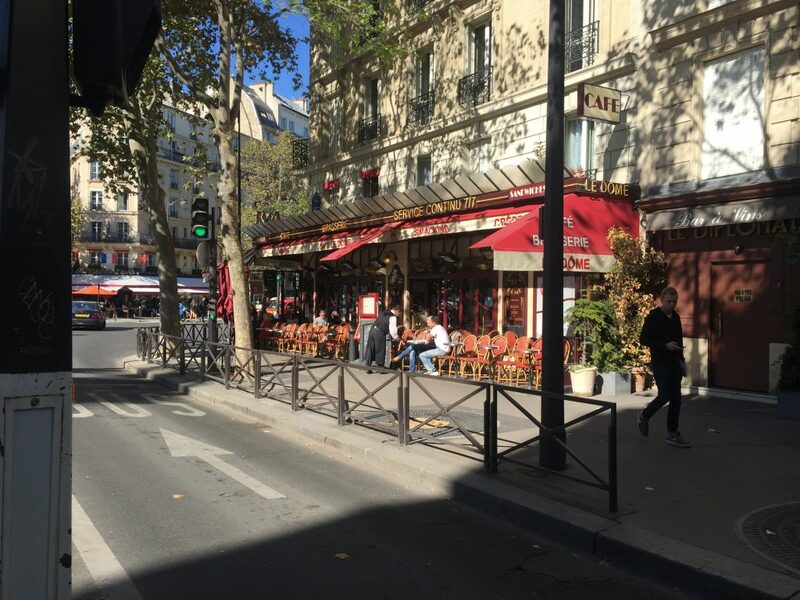 Iconic outdoor cafes where the French will bundle up and sit outside even in cold weather. 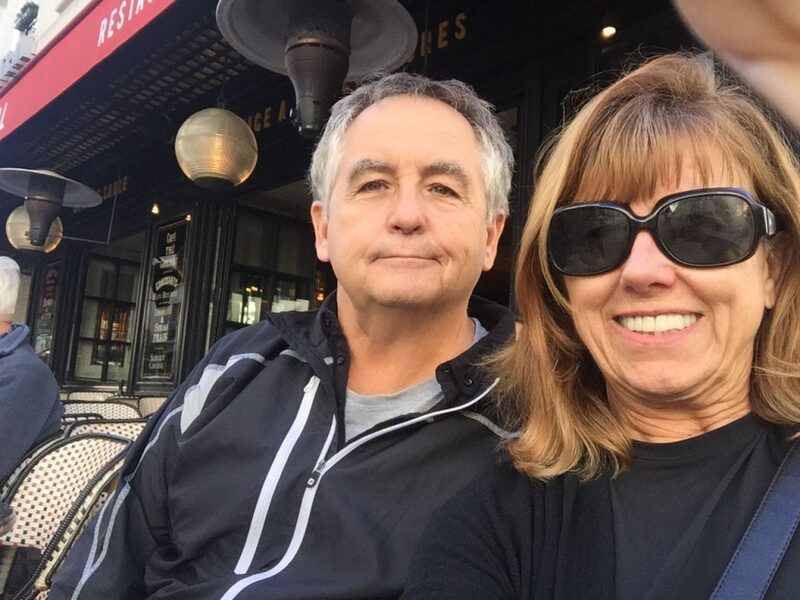 We sat outside and enjoyed a final cafe at our neighborhood bistro. We enjoyed our final Paris dinner at 7 eme VIN, 68 Avenue Bosquet. Recommended by a friend, it serves classic French cuisine. 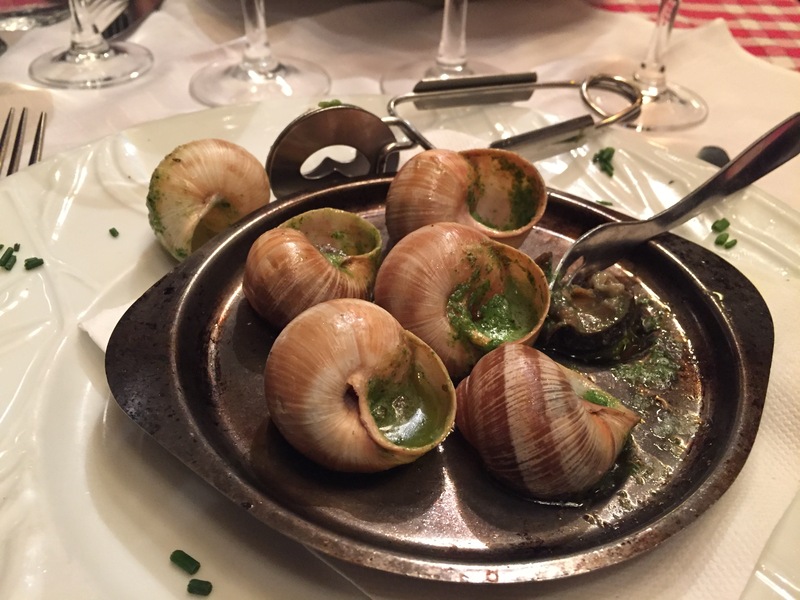 I finally tried escargots (snails). Our waiter showed me how to get them out of their shells. It was harder than it looked, but I got them out and they were delicious. 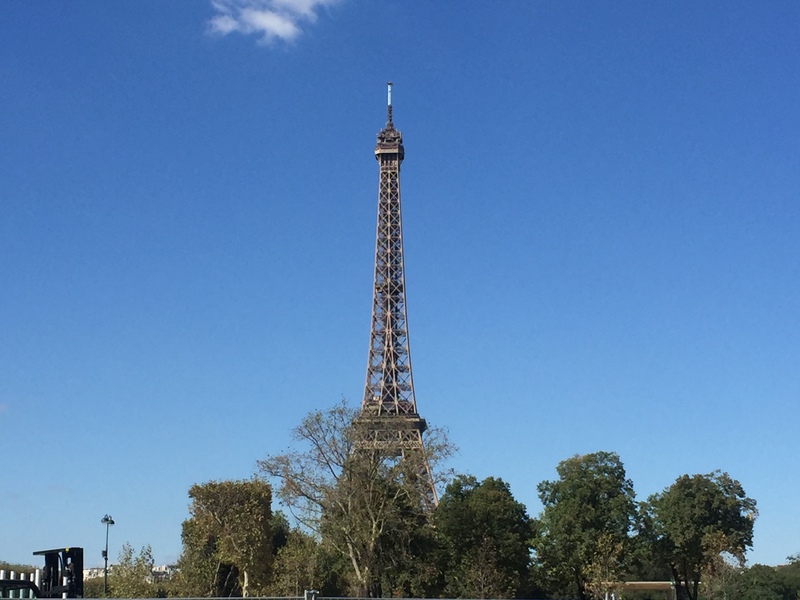 Here are some things I learned on this trip that may help my friends planning a trip to Paris. I do a pretty good job of packing light, but bringing the right shoes – comfortable, stylish and multi-use – has always been a challenge. Tennis shoes used to be a tourist dead-giveaway. 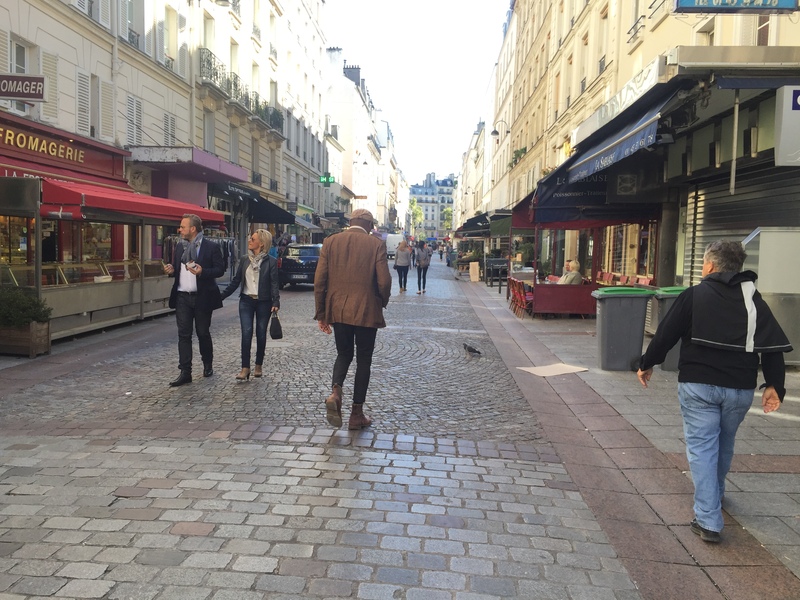 Now, it seems like at least half the people on the streets of Paris are wearing tennis shoes. Even white shoes which used to be the biggest tourist no-no of all are on the feet of some of the stylish Parisians-as long as they are classic Adidas Stan Smith white leather. Black leather is always a good choice and white soles are now quite stylish. Paris seems a little more casual than it was when I was here three years ago. I still see beautifully dressed women and men everywhere, but it feels a little more OK to be a bit less dressed up. Eating great bread is one of the special treats of Paris. Look for an artisanale boulangerie and order une baguette tradition which means that the bread was made on site in an established way with established ingredients. It really is the best bread. Don’t be afraid to use your French, no matter how limited. Often people smiled when I spoke French with them, and I always wondered how badly I had screwed up what I wanted to say. But I feel like they appreciated my efforts, and it made the trip more fun to speak the language. Paul expanded his French interactions from one word, merci, when we first arrived to at least ten French words he would comfortable attempt. At first I felt badly when I would speak French and a French person would respond in English. But a woman who has lived here for three years told me that is quite common when they hear an American accent. And, truthfully, it often made things easier. It’s been a wonderful seventeen days in the “City of Light”, and I know we will return soon. This entry was posted in Amsterdam, Bruges, Paris 2016 on October 3, 2016 by debbie.